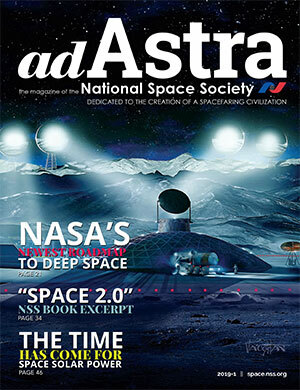 Ad Astra (“To the Stars”) is the award-winning magazine of the National Space Society, featuring the latest news in space exploration and stunning full-color photography. It is published quarterly and mailed to all National Space Society members as part of their membership benefits, as well as to subscriber libraries, schools, and businesses. A one-time member registration gives access to all full issues. Public back issue pages include book reviews, selected articles, table of contents, and more. Complete online electronic editions of issues from 2009 onward are available for members only with a one-time registration (using the link on any issue page). Kalpana One: What Will It Be Like to Live in Space? Shackleton Dome: Is a Domed Lunar City Possible? NASA’s Dawn Mission: Opening Up Asteroids to Space Settlement? Nuclear Power: Now More Than Ever, Or Never?